Our brand new VoteTokens system will resemble Factions v2.0, may it rest in peace. VoteTokens will now be a physical item, which means that they can be traded using ChestShops or even /trade! Along with this change, the new TokenShop will now contain even more items such as LWCKeys and every possible "staff" tool. For the sake of consistency, all staff tools have been removed from all places on the server besides the TokenShop and VoteParty. This way, no matter where you receive your tool, it will contain a fancy name and lore! Due to the lack of support by the author of the old CrazyEnchantments plugin, we have decided to switch the server to a new system called AdvancedEnchantments. This plugin is much more frequently updated, balanced, and has minimal economy-breaking aspects. This means that we won't have to put whacky systems in place to keep the economy from becoming destroyed due to the enchantments offered. 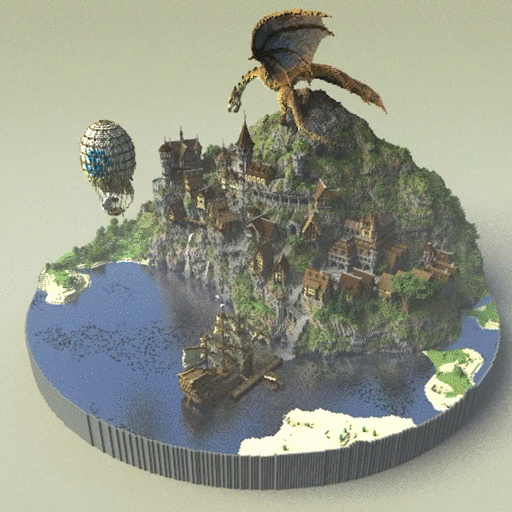 Furthermore, we have an extremely customized setup that's unique to our server only, including custom tiers and Magic Dust shops. This is definitely not a feature to skip out on! We extremely overestimated the amount of Player Shops we needed on the previous server. On Towny v3.0, we're happy to announce that we will have only 14 Player Shops in total (8 small, 4 medium, and 2 large). Furthermore, these shops will be rentable in single-day increments, starting at only $400 per day, with a limit of 30 days in advance! It is our hope that these shops will be much more obtainable for all players, rather than a small portion of players with extra money to spend. Using another similar system to Factions v2.0, we have implemented a fun Treasure Hunt game that will reward seekers with awesome items, such as extra scrolls, special items for AE Enchantments, McMMO experience, in-game money, helpful resources, and more! Every 6 hours, the Treasure Hunt game will begin. There must be at least 12 players online for this to occur (and Towny actually has a large enough community where these games should be fairly frequent). Thanks to our talented Manager, Kayoz, we have a very large 500 x 500 sized piece of custom terrain where these games will take place. We are still in the deciding phases about whether we want PvP to be enabled inside of this arena. Please comment below with your thoughts! Jobs are the most essential way to earn money on Towny v3.0. After extensive testing and tweaking, we've done our best to balance the Jobs even more than before, taking into account server settings and features such as mob spawn rates, AE Enchantments, and new 1.13 features! Along with these improvements, we are introducing two all-new Jobs: Chef and Netherworker! Players who join the Chef Job will be paid for creating craftable foods, while Netherworker will be paid for all Nether activities such as killing mobs and farming Nether materials. Some of the features highlighted above are much too complex to summarize in a single paragraph, so throughout the next few weeks, we will be separately releasing some more detailed posts outlining these features much more in-depth so everyone can know what to expect upon release! Brand new spawn building, made by Jstoeckm2. Server running the latest 1.13.2 version. Join using this version! Reworked all Crates and rewards for all 4 Crates. Reworked all Rankperks to make ranking up more desirable. Upon ranking up, you will be rewarded with a customized "Rank Trophy" collectable. Removed McMMO Credits system in place of McMMO experience coupons. Added single-use Kits for Towny ranks (Barbarian, Guardian, Lord, Champion). Customized the absolute hell out of CE(AE) Enchantments plugin. Much cleaner and aesthetically pleasing. Added /prefix command where all players can change their prefix in chat. New, custom and reworked /namecolor and /prefixcolor GUI commands. Reworked custom achievements. Less of them, but more valuable. Leveling up in your Job will reward more income than before. Added Inventory Insurance (custom plugin!). Keep your inventory upon death for a temporary amount of time! Players who have temporary /fly will safely be teleported to the ground upon login (custom plugin!). Added a $200 reward for killing a player for the first time. We'd like to conclude this huge announcement by thanking the amazing team who have worked very hard and in secret for the past 6 months, making sure that we delivered our best work. The Main world from Towny v2.0 will be available for download some time after the release of Towny v3.0. The date for this is yet to be released. @Daphsquid - Project lead, plugin advising, customizations, setup. @Fira - Plugin/feature advising, server ideas and planning. @JST - Building our new, stunning spawn. @Kayoz - Building the 500x500 Treasure Hunt map. @Matt - Wrote many custom plugins and features for Towny v3.0. @pastelnarwhal - Modifying and writing our server Tutorial Room. @Roesanna - Plugin/feature advising, server ideas and planning, Daph agitator. @sh2mrr5 - Extensive plugin testing, plugin/feature advising, server ideas and planning. Thank you and we hope to see everyone online for the big release on March 2nd, 2019! I am here and I am square. I'm also really glad the credits are in alphabetical order. Will backpacks be reset as well? Ah so the whole server will be reset then? Will our towny claims get refunded? They won't since the economy will be reset as well. I have 200 claims that I bought through the store, are those going to be refunded? Ah, well I'm not sure about that. No, the individual Towny perks that were previously available through our store are unique to Towny v2.0. We are completely discontinuing that server after v3.0 is released. Think of it as a server being closed down (and replaced by a better one). We, unfortunately, do not offer refunds for anything purchased through our donation store. However, donation ranks (Donator, Sponsor, VIP, etc.) transfer through the entire network, so these will be carried to Towny v3.0, and any other servers that exist after it (hence, the word "global"). Our policy is that all perks will be active until the server doesn't exist anymore. In this particular case, Towny v2.0 will not exist after v3.0 is released. I hope this clears up some confusion! GUAHAWHAAHAWHAH IM SO HYPE FOR NEW TOWNY!!!!!! If you have any further questions about this, please email us at [email protected]. I will not be commenting or allowing comments regarding this matter any further on this thread because there is a much more appropriate place to voice any concerns you may have with our donation store or its workings.